Mark made this as part of our Christmas feast and they were awesome. They were probably the most-complimented dish on the table. The addition of nutmeg to the cheese mixture made it especially good. This dish can be made ahead and stored in the refrigerator for a day or two or the freezer for up to a month. Heat oven to 375F degrees. Cook pasta according to package directions. Meanwhile, in a medium bowl, stir together cheeses, eggs, parsley, salt, pepper and nutmeg. In a 9 x 13″ baking dish, spread 1/2 cup spaghetti sauce. Fill each cooked shell with about 1 1/2 tablespoons cheese mixture. Layer one half filled shells in prepared dish. Spread one half of the remaining sauce over shells; layer remaining filled shells over sauce. 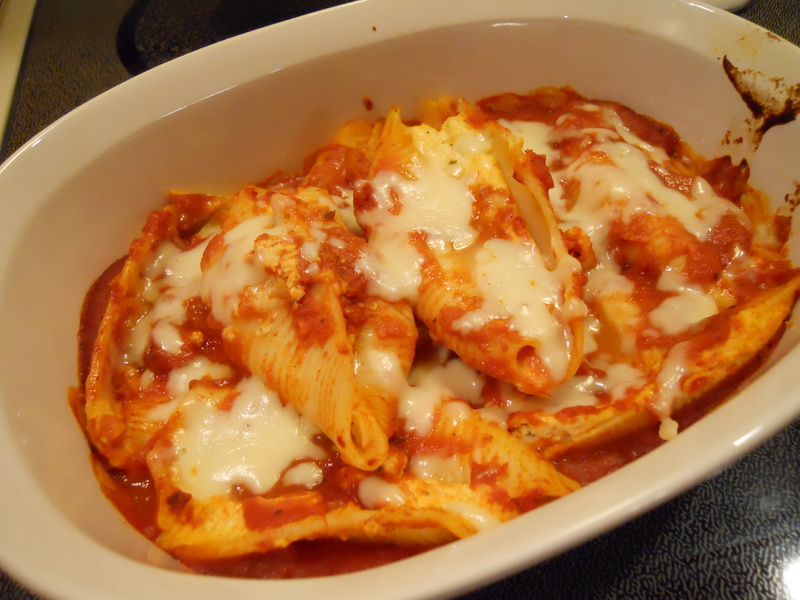 Spread the remaining sauce over shells and top with additional mozzarella cheese, if desired. Cover with foil and bake for 35 minutes or until hot and bubbly.